The fall months are coming and the leaves here are just beginning to turn. Apples are starting to ripen, nuts are starting to fall. And with a quiet walk through the fall woods, you might be lucky enough to see a sassafras (sassafras albidum) in her fall splendor. She will be decked head to toe in yellow, orange, red, purple, and magenta; an old sassafras tree in full fall foliage is certainly a sight to behold. With her wavy trunk and twisted branches, Sassafras makes no apologies about her ability to stand from the crowd. Her four variable leaf patterns (mittens (right or left), single leaves, double mittens) help show her flexibility and charm. 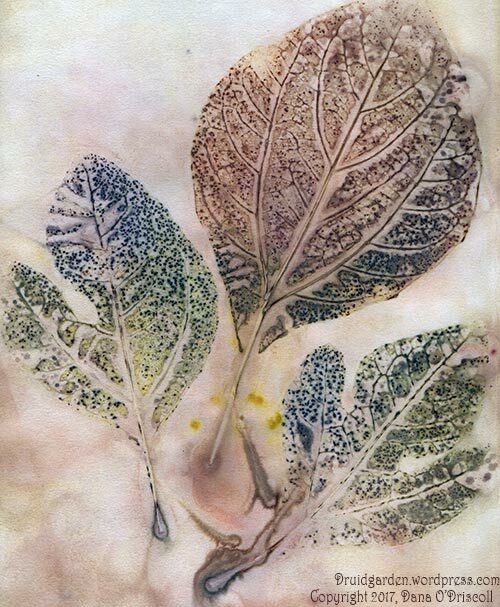 While Sassafras is not present in the traditional Ogham or other Western Magical Traditions as she is distinctly an American magical tree, she is a powerful tree with much to offer us. Sassafras has been called by many names and these names help teach us some of her power: auge tree, saxifrax, cinnamon wood, cinnamonwood, saloop, smelling stick, chewing stick, tea tree, winauk (Native American in Delaware and Virginia); Pauane (Timuca Indians); Kombu (Choctaw); and weyanoke (Algonquin). Sassafras is typically a fairly small tree, growing 20-40 feet in height with a trunk 1-2 feet in diameter in the northern end of her range. In southern portions of its range, she can grow much larger, up to 100 feet high. Her wood is soft and light-colored with a faint aromatic Sassafras smell. Her wood is brittle, coarse-grained, and rot-resistant although it is not very strong. Typically, her wood has been commercially used for posts and lumber, but wood carvers also enjoy working with it. Sassafras is dioecious, that is, the male and female flowers appear on separate trees. The females will eventually have fruits ripen (which occur around midsummer) whereas the male trees will not. If you’ve ever met a mother sassafras in the forest, you will likely have seen her many babies surrounding her on the forest floor. Sassafras reproduces through cloning through her lateral root system. The mother tree, usually much larger, sends off rootlets that pop up new baby trees. The babies live by the nutrients of the mother tree and hope that the forest will open up enough to give them life and light to reach into the canopy. Sassafras is a sun-loving tree that needs at least part sun to thrive. This is why you will often find her on the edges of forests, or in forest openings, but certainly not in dark forest spaces. Sassafras is a tree native to North America, and as such, played a critical role in the Western colonization of North America by the Europeans. Sassafras was the first “discovery” and export from North America back to the Old World, at a time when wood and wooden objects were central to everyday life. In A Sampler of Wayside Herbs, Barbara Pond suggests that it was the hunt for Sassafras that actually inspired early Colonial exploration; for example, in 1602, Gosnold was very excited to discover growing on Martha’s Vineyard Island. In the 1600’s, massive amounts of ships called “Sassafras carriers” brought Sassafras wood and roots to the old world. In 1570, Thomas Hariot included in his report from Virginia, “Sassafras, called by the inhabitants Winauk, a kind of wood most pleasant and sweete smel, and of most rare vertues in physic for the cure of many diseases.” Eric Sloane in In Reverence of Wood writes about it as the “American Wonder Drug” and it grew in popularity such that it became known to cure any ailment or disease and as a genearl health tonic to keep one prime and to allow one to live a longer life. Even as early as 1577, a book by Dr. Monardus, a Spanish Physician, was translated into English titled, The Joyful News from the West Indies and it described the medicinal uses of Sassafras, which helped continue its prevalence of an import from the New World. In 1600, from a book by John Brereton, he reports sassafras selling for at least 3 shillings a pound; 1 ton was sold 336 british pounds (which was quite a lot in those days). Because early Sassafras ships made it back to England without harm, Sassafras also quickly developed a reputation for being a “lucky wood” and a “protective wood”; Eric Sloane writes about how people soon were making many things of sassafras, such as spoons, cradle inlays, and bible boxes (to keep away evil spirits). Sassafras wood was included in new ship designs to keep away evil spirits and prevent the ship from being wrecked. Further, for over a century, it was considered to be able to extend life, cure all things, and drive away any sickness. And so, from the time of early Western exploration in the new world, Sassafras was a highly regarded and sought commodity that offered healing and protection. Sassafras has a long history of use in traditional Native and Western medicine, but today, safrole, which is concentrated in the roots is considered “possibly carcinogenic” by the US Food and Drug Administration. Safrole is the primary aromatic ingredient in sassafras root bark; it was declared as a weak carcinogen on the liver by the FDA in 1976 and is still listed as such. Safrole is, notably, also present in lesser quantities in camphor, nutmeg, and mace. In the herbal community at present, given this tree’s extremely long relationship with healing and humanity, a lot of folks sassafras occasionally without adverse effects. A lot of folks in rural Appalachia also drink sassafras tea regularly, just as their ancestors drank sassafras tea in their spring tonics and root beers. When I studied with Jim McDonald, he noted that Nutmeg contains almost as much Safrole as Sassafras and yet it wasn’t banned–he wondered if was banned because it can be made into ecstasy/MDMA in a lab. He also noted that the studies took sassafras essential oil and injected it into rats–and no further research has ever been done (such as what happens to humans drinking tea as opposed to huge consumption of concentrated essential oil). Matthew Wood in his New World Herbal notes, “Safrole is a neurotoxin and carcinogenic in isolation, but tests have shown that people who drink the tea for years actually have a reduced rate of cancer. Still, the unadulterated sassafras root and root bark remain suspect” (315). Further, in the Peterson Guide, it is noted that there is more carcinogenic substances in a can of beer than a can of traditional root beer with sassafras as the main ingredient. Given the complexity of the issue, I would suggest that you read for yourself (looking at the original studies of which there were not many, and they were done on rats) and make up your own mind about whether or not you want to consume any tea on an occasional basis. I certainly enjoy it on a regular basis. Note that the leaves of Sassafras, which are used in Creole cuisine as a thickener for soups, are perfectly safe and do not contain any safrole. Understanding Sassafras’ growth habit and reproduction through lateral roots is a great way to get copious amounts of root without damaging a large tree. Sassafras seedlings can’t survive long in full shade, so they either need an edge or a forest disturbance (like a tree falling and making a clearing). You can harvest some of the roots between a seedling tree and a mother easily. I harvest roots of seedlings particularly in full shade areas–I know the seedlings won’t live long without a forest opening. The other easy way to harvest sassafras roots is to wait for a storm to drop one–then you can simply saw them off and harvest all the roots. The inner root bark is the most aromatic and medicinal, so even very large roots from a mother tree that has fallen would work very well. The roots of small Sassafras trees can be used as is; the larger roots from a fallen tree have to have the tough, outer root bark peeled and removed prior to use. Sassafras Root Spring Tonic: As described above, the Sassafras was taken internally for a variety of healing purposes throughout the ages. Traditional herbalism recognizes Sassafras as a “spring tonic” or “blood purifying” or “blood thinning” herb and is used in the spring in quantity for this purpose. In 1830, Constantine Rafinesque wrote, “The Indians use a strong decoction to purge and cleanse the body in the spring” (Quoted in Wood, 315, New World Herbs). Wood notes that it “promotes clear thining in old age from good circulation to the brain, to improve the peripheral circulation to rid the joints of arthritic depositions, and to promote diuresis” (316). Euell Gibbons in Hunting the Wild Asparagus notes that traditionally, Sassafras Root tea was made with maple sap water for spring tonic. He noted that even in the 1950’s, when he wrote his book, that many folks still drink Sassafras tea “as a spring tonic, believing that it thins the blood and prepares the body to better stand the coming heat of summer.” Gibbons offers this medicinal tea: 3 tablespoons of honey, 3 tablespoons of vinegar (I would suggest a fire cider here) and 1 quart sassafras tea. Chill and serve as a spring tonic. Blood and Circulatory System: Today, herbalists recognize sassafras root as a warming, spicy, and aromatic herb that functions as an alterative (tonic) for the liver with mild antiseptic qualities. It has a specific action on the blood and circulatory system, stimulating blood flow and enhancing periphery circulation. It is also used to prevent heart attacks from thick, coagulated blood. Jim McDonald notes that it has a specific action on the blood and circulatory system, stimulating blood flow and enhancing periphery circulation. It can address circulatory congestion issues (such as cold fingers and toes, varicose veins, or pelvic circulatory issues). Matthew Wood notes that could also be used to help increase circulation during a fever (along with boneset and elderflower). It can function as an aphrodisiac if poor pelvic circulation is causing the reduction of the libido. This is typically taken in tea form. Because the aromatic qualities are the medicinal ones, Jim McDonald recommends a shorter boil (3-5 minutes) and then let the roots sit for a long time (like overnight) before consuming it. Matthew Wood also notes a number of other Native American uses. One such use as a fever remedy; they used the heartwood of sycamore, wild cherry bark, mountain mint, and Sassafras as fever remedies. Sassafras root bark was also Native American bruise remedy; they made an oil or powered the bark and added mullein for bruises, swollen faces, etc. Native Americans also used the leaves to treat wounds by rubbing fresh leaves on an open wound. The entire tree–wood, leaves, and roots–of Sassafras has offered humans a range of benefits. Dyes: Sassafras root has been used as a nature plant dye. Typically, you get either a pink or a warm brown, depending on quantity. The Pennsylvania Dutch used it often to dye linen or hemp that they grew. I haven’t used it much for this purpose as I’d rather make root beer and use other plants to obtain similar shades. Sassafras root is not always abundant to harvest and so when I do harvest it, I want to make the most use of it. Flavoring: People have traditionally used Sassafras essential oi for flavoring gumdrops, drinks, and also for soaps. Today, you can purchase commercial preparations of Sassafras EO with the safrole removed that can still be used for this purpose. Moth and Bug Protection: Sassafras wood has been used to make boxes and chests for protection against bugs and moths (similar to Cedar). Traditionally, people even built henhouses out of it to keep insects out of the henhouse. I’ve made my chickens’ perches out of sassafras and cedar with great results in this regard. You can also us a bag of sassafras wood chips near your clothes to repel moths. Culinary: Sassafras leaves (dried and powdered) are a wonderful thickener for soups and stews. To harvest them, you can get them anytime they are mature throughout the summer. Remove the stems and veins from the leaves, and then powder them up in a mortar or pestle. You could also use a food processor, but I’d take it outside as it can produce a fine dust that you don’t want to breathe in in your house. In Cajun cooking, file gumbo (file = Sassafrass) is a particular kind of gumbo that is thickened with the sassafras leaf. The leaf offers a really nice flavor (when compared to flour or cornstarch) that is a bit sweet. Here’s a link to a recipe I really like. Wild Food- Trailside Nibble and Salad: You can enjoy sassafras leaves fresh while on the trail. They have a scent similar to fruit loops and a sweetness that is very nice and soothing. You can also use the young leaves in salad. Even in the winter and early spring, you can nibble on the winter buds. For this root beer, you make a simple syrup and then add seltzer/fizzy water to the end result. Simple syrup is made of equal parts of water and sugar (or another sweetener of your choice, like honey or maple syrup, both of which are more healthy). You add ingredients to this and simmer them for a certain amount of time (depending on the nature of the ingredient). Roots are typically simmered at least 20-30 minutes (with the lid on). In a saucepan, combine 2 cups water and 2 cups sugar/honey/maple syrup. Add 1/2 cup Sassafras roots and handful of black birch branches. I like to add juniper berries or star anise here as well (1 tablespoon each). Simmer the mixture, stirring often, for 20 minutes with the lid on. Be wary of boiling off too much water (and you can always add back a few tablespoons if necessary). Strain your mixture and pour into a mason jar. Let cool and store in the fridge (it will keep up to a month; you can also can it and/or freeze it). When you want to drink it, add about two tablespoons to seltzer water and enjoy. Curse Removal. IN Sacred Medicines of the Cherokees, a book on Cherokee Shamanistic practices, Sassafras was part of a magical and medicinal treatment for children who were cursed by having the shadow of a bird fly over their mothers while they were still in the womb. The medicine consists of a warm decoction of the bark of Sassafras, Flowering Dogwood, Service Berry, and Black Gum with the roots of two wild rose species. The bark is always taken from the east side of the tree as are the roots (growing to the east). The roots and barks are seeped in warm water for four days and then the child is bathed for four days and four nights with the decoction. At the end of each treatment, the Shaman then blows the decoction out of his mouth, showering the child, while the child keeps his/her hands out while a prayer is recited. Then the child drinks a bit of the decoction. Further, in Cherokee Plants, Hamel and Chiltoskey note that sassafras flowers were often combined with beans and then planted. Its unclear why, but it might have been to protect them or help them grow in some way. Safety. The Chocktaw Flood Myth, which shows up in various versions depending on the source, discusses how humans grew corrupted and the Great Spirit sent a flood to the land. One man who as a prophet tried to get people to change their ways, but it was to no avail. Eventually, the storms came and he was directed to build a raft of strong sassafras logs, which saved him and various others (the myth neatly parallels the Noah’s Arc myth). Here, the Sassafras logs were the instrument of safety from the raging waters. Sassafras, Taboos, and Fire. Tribes seem to have varying relationships with sassafras when it comes to fire. Sassafras is tabooed among burning. For example, among the Cherokee, burning Sassafras is considered taboo (one white author reporting on the taboo notes it might be because sassafras pops when burned and could set things on fire). Another ethnographer notes that other tribes used it to start fires. Because Sassafras is a new world plant, the Western Magical tradition has very little to offer. One exception to this is Hoodoo, which is a distinctly American magical tradition. In this tradition, Sassafras has a very specific use as being tied to wealth and money. Cat Yronwode in Hoodoo Herb and Root Magic suggests that sassafras can be used to bringing in wealth, good fortune, and overall success in business. She notes that people have used it to make money mojos (for holding onto money) to sidewalk scrubs and carpet sprinkles to bring money into a business. I strongly suspect that this use of sassafras is directly related to the relationship that Sassafras had to colonization, exporting, and its status as a highly sought commercial commodity in the 160o’s and beyond. However, if we delve into other kinds of folk magic practices, also tied to the commercialization and belief that Sassafras could cure any ill, we see Sassafras having a number of different roles, again, mostly concerning its “curative” properties. In Travels into North America, from 1772, P. Kalm writes, “Swedes wash and scour the containers in which they intend to keep cider, beer or brandy with water in which sassafras root or its peel has been boiled; which they think renders all those liquors more wholesome.” Further, the Pennsylvania Dutch also added sSassafras root to their apple butter or applesauce to enhance flavor; they also added pieces of sassafras root to dried fruit to keep out worms and add flavor–and possibly for other reasons (which was hinted at in an old cookbook I have here on the shelf!). Wealth and Financial Gain: Sassafras is certainly tied to financial gain and “keeping” wealth or resources (or bringing it into one’s life). This is clear not only from the plant’s 400+ year old history here in the US, but also from the preservation of this focus in the Hoodoo tradition. Good Health: Sassafras has broad healing powers, particularly associated with longetivity and having overall good health and a good life. We see this first in the Native American herbal uses and lore, and that knowledge was clearly transferred into Colonial America as well as back to Europe. Part of this good health aspect seems directly tied to consuming the root in various ways (in Gumbo, teas, etc). Protection and Safety: Both in Native and in Western/Colonial lore, it is clear that Sassafras wood has strong protective qualities. When this wood is shaped and used in various applications, it offers protection, not only from bugs or mites (as in the case of chicken coops) but also from stormy seas, travel, and general woes and ills. We also see this tied into the idea that she might be used to remove curses in various ways (through a brew of her bark). Sassafras is a wonderful and powerful plant ally who is certainly worth getting to know better–may her magic and mystery unfold within your own life! Were you using an enamel pot? That would make sense! My enamel pot was stained with black walnut husk ink many moons ago, haha! You can easily order sassafras online :). It is a very wonderful experience–kind of spicy, kind of like cinnamon, kind of sweet, but uniquely sassafras. Hi Dana! We were just discussing sassafras on a group hike on Saturday, funny that it’s on your mind now as well. Did you come across any references to using it as an insect repellent in your research? It’s common wisdom among Appalachian Trail hikers, I think because one of the early thru-hikers (Granny Gatewood, who was 67 when she hiked in in the 50s) always did so and she got a lot of press coverage. Whether people believe, or if it works, is another matter, but I know some folks swear by it. Yes, I found that and a few of the references. One of the references was a Native American ethnobotanical reference, so my guess is that the natives used that as well. Generally speaking, any strong aromatic plants can deter certain bugs. I’m not sure that sassafras would be more effective then citronella or geranium, but it’s worth a try. Especially if you only have sassafras :-). Thank you for providing sources for your information. Your site entry is the *only* one I found of many that includes the sources of the information. I’m grateful for that. It is shocking how many simply pass off information on the web without regard to where, when, who, or what. Absolutely. I think we need to trace the material to the source–otherwise, people could just make up whatever they wanted :). Thanks for reading! I’ve started to read through your sacred tree posts, because I’ve recently felt drawn to learning and using Tree Ogham, but would very much like to connect it to my local ecology. For those Ogham connected to tree/plants that don’t naturally grow in the U.S., do you feel like it is appropriate to seek out local varieties with a similar resonance? Or might the goal better be to create something inspired by tradition Ogham letters but an outgrowth 😉 of it, perhaps creating a new mark? Oh, Sassafras is such a sweet and wonderful tree. No negativity from this tree, ever! 🙂 Thank you for reading!